It was the coincidence of coincidences that I tasted some of these little peppers at a dinner party last year and then discovered I’d actually planted one seedling of this variety. So, it was quite by accident that I ended up with a bumper crop of shishito peppers to enjoy all season. It’s no accident this year that I am growing more shishito peppers. I sought out another single seedling plant (one is enough for us). It’s happily growing in our community garden plot. 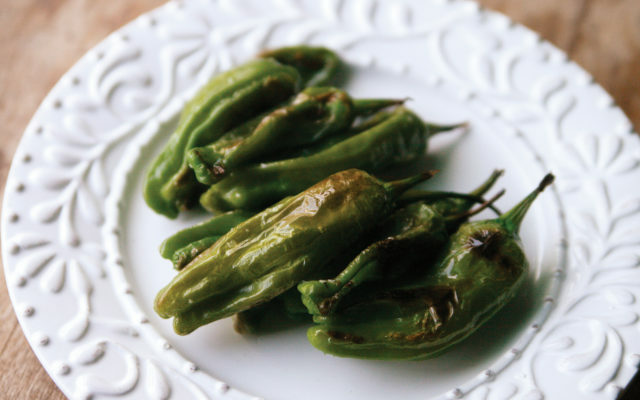 The venerable shishito pepper is small in size but robust in flavor. Usually sweet in flavor — once in a while you’ll get a spicy one — these little peppers are excellent served blistered and warm with a squeeze of lemon juice. But how to blister them? Frying them in a cast-iron skillet in hot oil is great. But for a more healthful take, try roasting them, as in this recipe. Roasted Shishito Peppers starts with tossing the peppers with olive oil and seasoning them with salt and pepper. Spread them on a baking sheet, and them roast them in a hot oven for a minute until they begin to brown and blister. Serve these as a side dish with a drizzle of lemon juice. If you don’t have shishito peppers growing in your garden though, don’t fret. Check with local farmers. At least one farmer at the Bangor Farmers’ Market on Sundays had them last year. In a small bowl, toss together the peppers and olive oil. Season with salt and pepper and toss again. Spread over the baking sheet. Bake for 5-8 minutes, until browned and blistered. Remove from the oven and sprinkle with lemon juice (if desired).